Quick, easy Peanut Butter & Jelly Pretzel Bars! 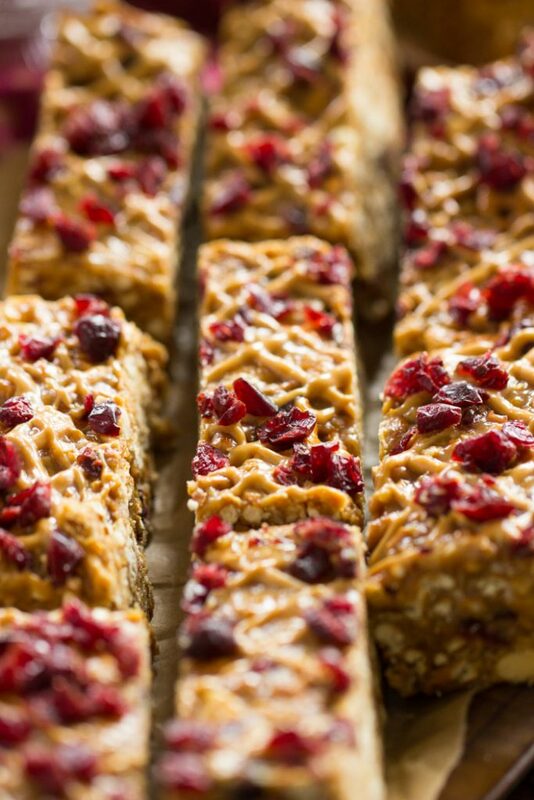 Super simple, no-bake pretzel bars with loads of peanut butter and dried fruit! 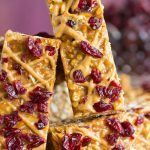 These Peanut Butter & Jelly Pretzel Bars are such an easy and delicious snack for packing in lunch boxes or breakfast on-the-go! Good morning, and happy Monday! I cannot believe that today is the last day of July, and that we’re moving onto August. It is incredible how time flies. I feel like summer’s hardly started, yet August is here, and fall is just around the corner. We went bowling on Friday night with some family, and I learned that my S.O.’s nephew is already back in school! His niece starts back mid-August, and I know a lot of other friends with kids are already preparing to get back into a school-year routine. I don’t have kids myself, but I certainly know the importance of having simple recipes for quick snacks and lunchbox treats. I was a kid once too, of course! Also, I still pack my lunch, so some things don’t change. On top of that, I like to send my S.O. off to work with some food and snacks too. Today I have your new favorite lunchbox treat. No, really. It is impossible not to fall head over heels for these Peanut Butter & Jelly Pretzel Bars. 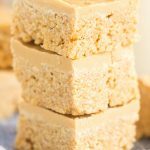 They’re quick to prepare, the recipe makes a large batch, and they’re great for taking on-the-go. They don’t have a long ingredient list, and everything is easy to find. 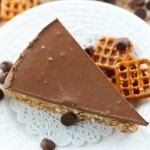 These No-Bake Peanut Butter Pretzel Bars are beyond delicious, and you’re going to be totally hooked on them. I had a lot of the ingredients on hand already, and I grabbed everything else I needed at Target, including a 16 oz. bag of Snyder’s of Hanover Pretzels. While I was there, I also grabbed a variety pack of Lance Sandwich Crackers. I grew up on those crackers – my brother and I always had them in our lunch boxes when we were kids. These were a regular staple that my mom would send with us to school. And when I was in high school, I remember stashing these for a snack to have at softball practice. My S.O. and I still keep them around the house because we like to take them with us as a snack when we’re out golfing, and I like to have a package in my gym bag. 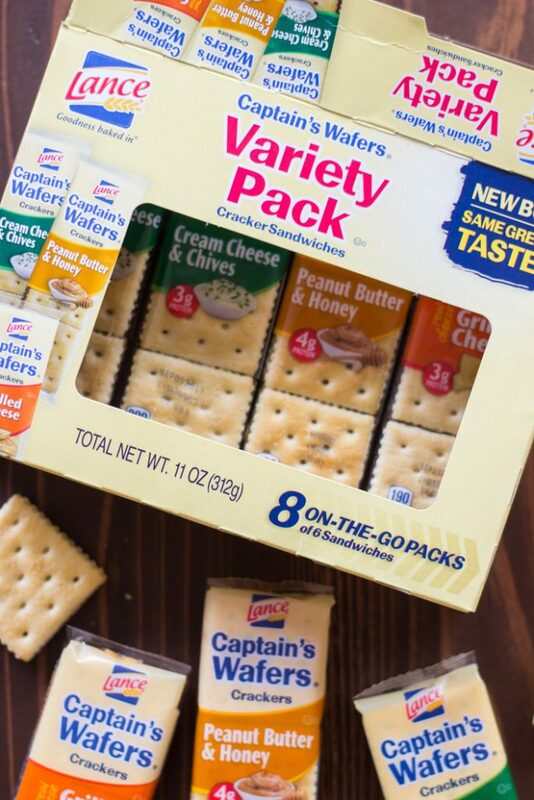 Those little packets of crackers are so filling, and they’re super portable and convenient. I love that there are so many varieties, and they’re all so tasty, flavorful, and satisfying. 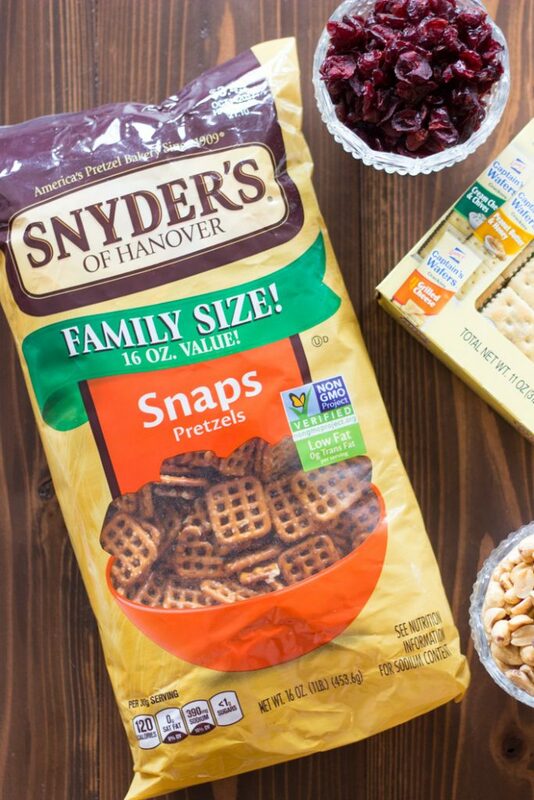 The pretzels, well, I adore the Snyder’s of Hanover Pretzels. For snacking, I always pick up the Butter Snaps, and for recipes, I usually choose original Snaps. 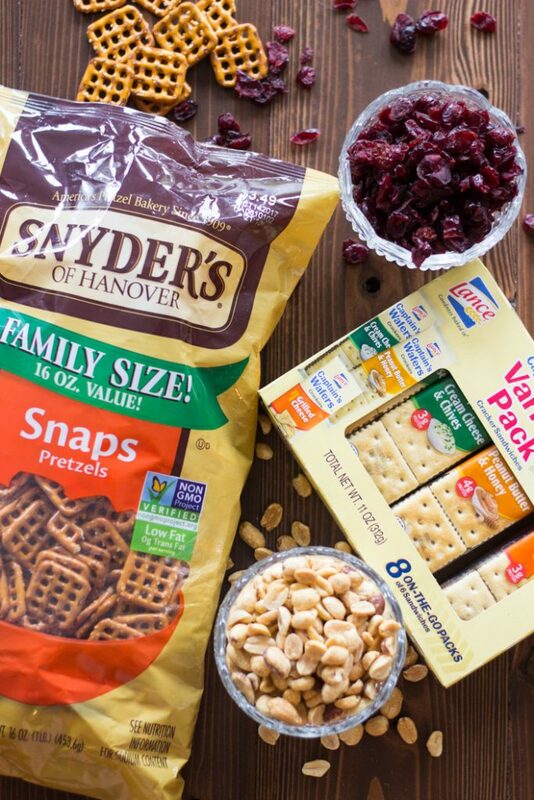 Whatever your preference, Snyder’s of Hanover has a variety of flavors, they’re made with simple ingredients, and they’re loaded with crunch and robust flavor. I love that Snyder’s produces a lot of variety and options. They’ve been making pretzels for over 100 years, so they know what they’re doing! I used an entire bag of crushed up pretzels to make these Peanut Butter & Jelly Pretzel Bars. The primary base is pretzels, and then I threw in some oats for added heartiness. 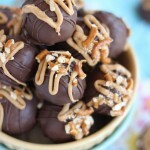 These are LOADED with peanut butter. Peanut butter and honey is largely what makes them stick together! And ‘stick’ they do! They’re sticky like a granola bar, and they’re SO chewy. 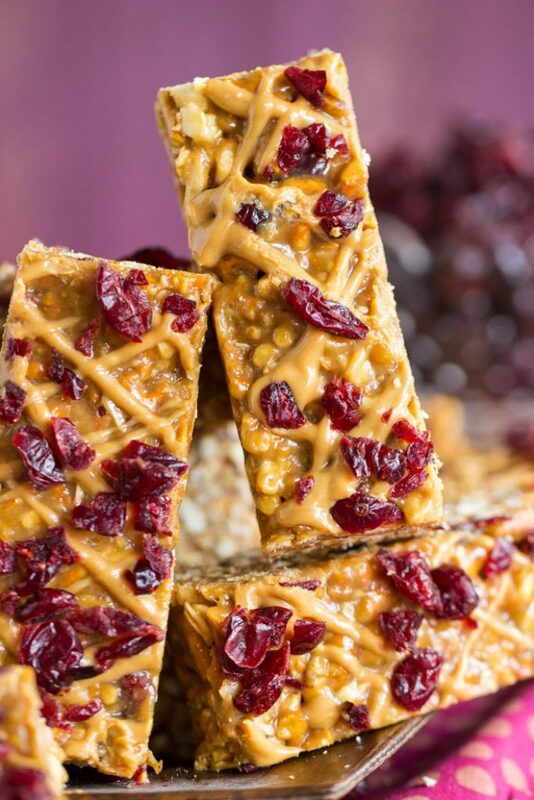 All the peanut butter and honey in these Peanut Butter & Jelly Pretzel Bars makes them so chewy and ooey-gooey. Although they’re soft and chewy, they still manage to be crunchy too! The pretzels add nice crunch, and their saltiness cuts through the honey and the sweetness of these bars. Peanuts provide the same – a bit of crunch and a touch of saltiness. I love sweet & salty treats, and Peanut Butter & Jelly Pretzel Bars definitely have that going for them. The dried cranberries are tart and fruity, and absolutely give these a ‘jelly’ or ‘jam’ vibe. They are the jelly to this PB&J-themed treat! I also recommend dried cherries if you have them on hand! These Peanut Butter & Jelly Pretzel Bars are filling. I ate one bar and I was completely satisfied and satiated. These are hearty little bars! They pack up easily to send off in lunchboxes and as snacks on-the-go, and they’re easy to throw together! Peanut Butter & Jelly Pretzel Bars! 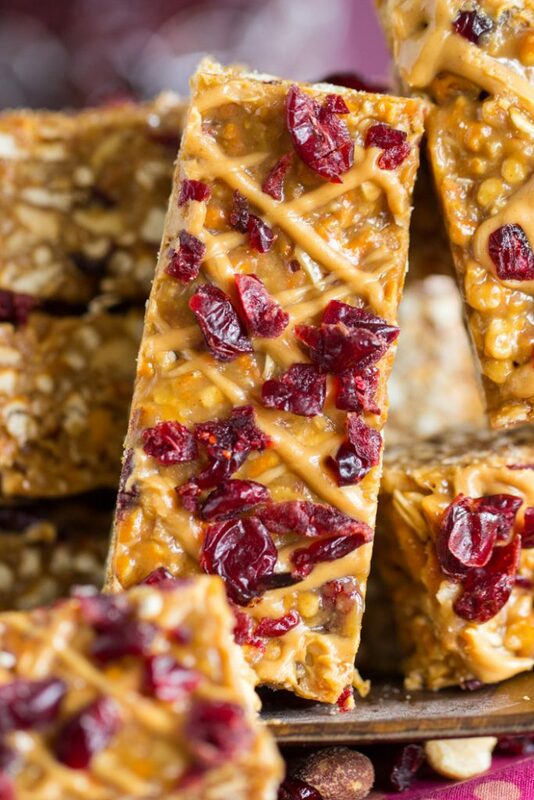 Super simple, no-bake peanut butter pretzel bars with loads of peanut butter and dried fruit! 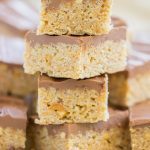 These Peanut Butter Pretzel Bars are such an easy and delicious snack for packing in lunch boxes or breakfast on-the-go! In a large stock pot over medium heat, combine corn syrup, honey, and granulated sugar. Stirring frequently, bring mixture to a simmer. 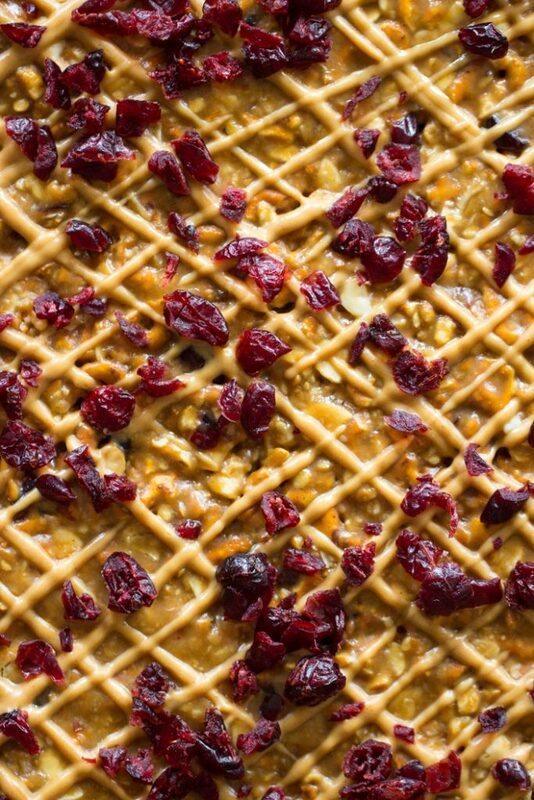 Remove from heat, and immediately stir in oats, pretzels, cranberries, and peanuts. Press mixture evenly into a lightly greased 9x13-inch pan. 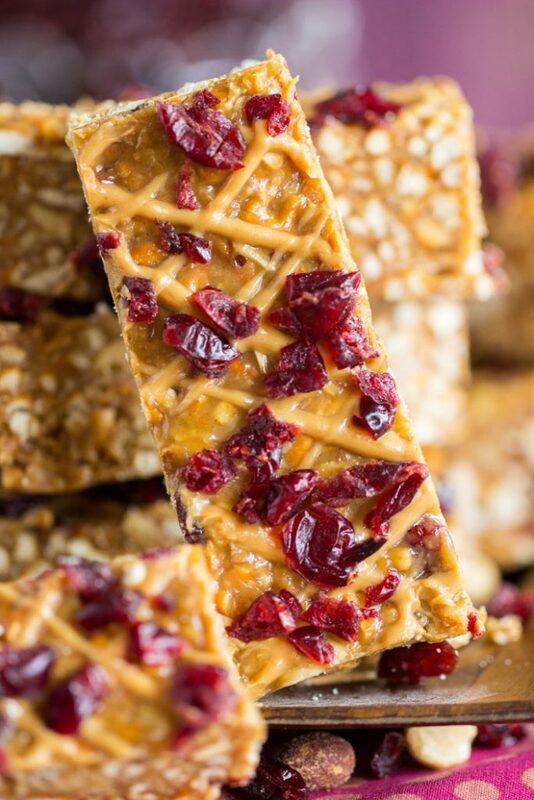 Drizzle with melted peanut butter and sprinkle with dried cranberries. Allow to set for at least 1 hour. 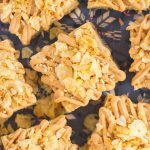 Cut into bars, and enjoy! 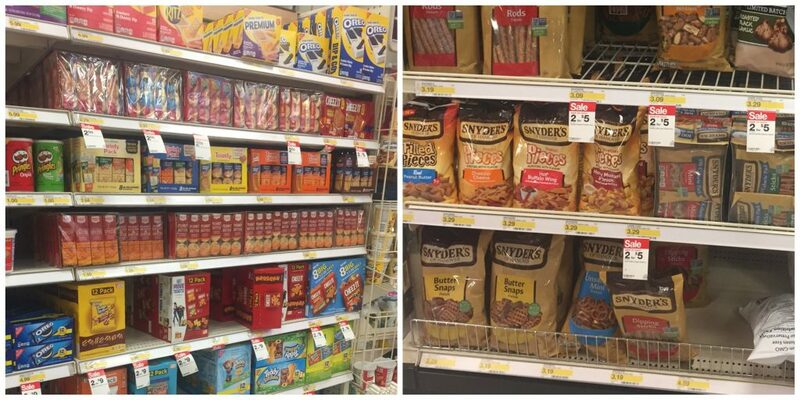 To save on your favorite lunchbox treats and snacks, check out the coupons below! They’ll be live from 7/30 to 8/7. Just click on an image below to access the coupon! $1.00 off 2 on Lance 8ct & 20ct Homepack and Nut Bars! $1.00 off 2 Snyder’s of Hanover 5oz. or larger! $1.00 off 1 on 16ct Variety Pack! 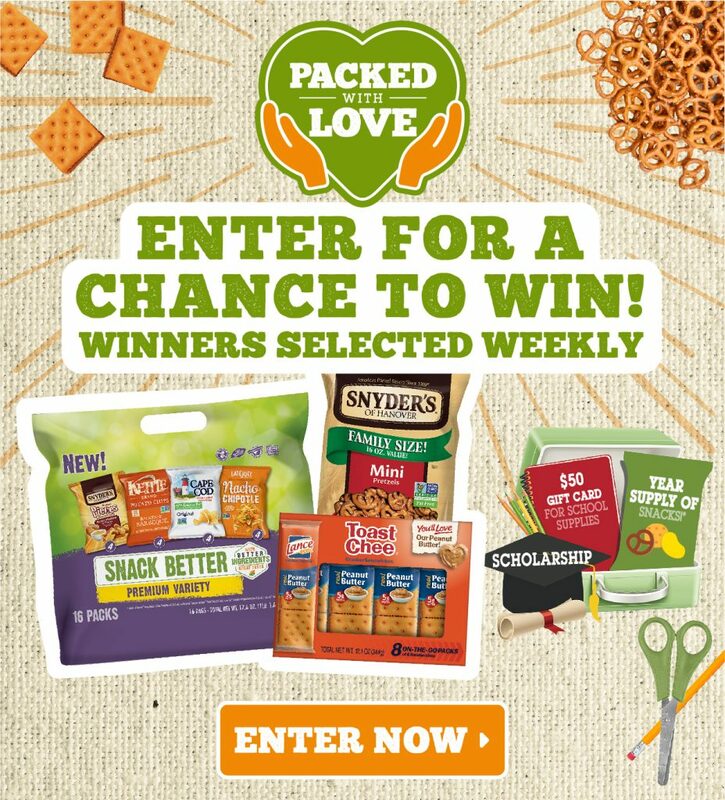 Enter to win the “Packed with Love Sweepstakes” running from 7/15/17 – 8/28/17! There’s a bunch of fantastic prizes! Peanut butter and pretzels? Yum!